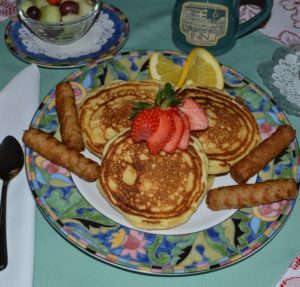 Find great out-of-the-box recipes for National Pancake Month from Distinctive Inns of New England innkeepers. February is National Pancake Month when hungry Americans dedicate all of February to pancakes. And it doesn’t stop there. 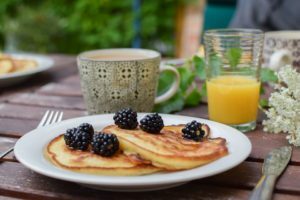 National Pancake Week is the 3rd week in February and Distinctive Inns of New England (DINE) is prepared to help you get ready. When it comes this breakfast staple, the 12 Distinctive Inns of New England innkeepers roll up their sleeves and employ creativity. 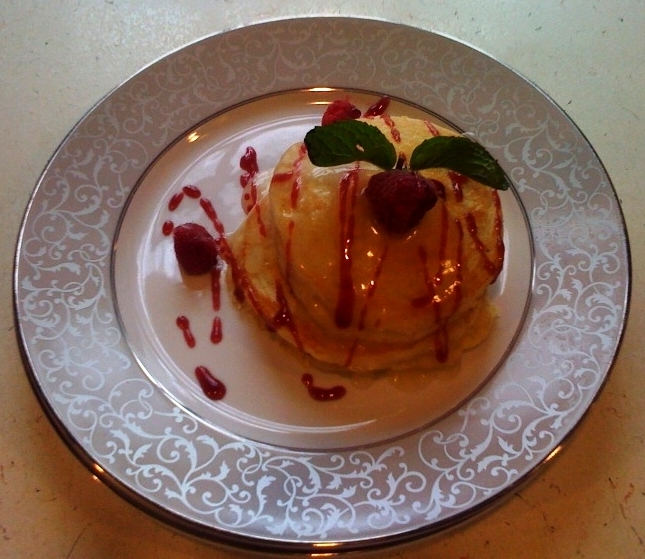 Thinking outside the box, DINE innkeepers push the envelope with pancake prowess to delight guests each morning. What can be more delightful than a homemade breakfast each morning to top off the perfect romantic getaway? Whether it’s wow’ing them on Valentine’s Day or celebrating Pancake Month, the 12 Distinctive Inns of New England have pulled out the stops to offer these pancakes with panache. Stir all ingredients together and serve over pancake. While some people scoff at times being offered pancakes due to many pancakes dry and cake like texture, that won’t be the case with these babies. The Ricotta Pancakes served at the Inn at Harbor Hill Marina have consistently won pancake haters praise time and time again. 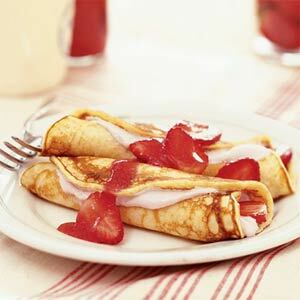 And if you like so many already like pancakes, you’ll absolutely love these! While somewhat hard to believe, the ricotta cheese base adds such a light creamy texture and unique flavor we’re sure you will agree ~ they just might be the best pancakes you’ve ever had. Let cook for about 2 minutes on each side until golden. Repeat & Enjoy! In a separate bowl, combine the berries, sugar and orange juice. Let macerate while making pancakes. Serve pancakes garnished with the berries, powdered sugar, and maple syrup if desired. Mix dry ingredients together in a large bowl until incorporated. Add milk and egg to dry ingredients and continue mixing. 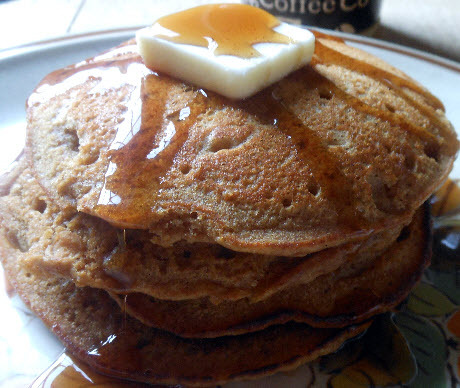 Add melted butter and molasses to pancake batter and mix again. Preheat a griddle or fry pan to 325ºF. Lightly grease with butter. Ladle out batter to the desired size. Cook on one side until the batter bubbles. Then, with a flat spatula, turn each pancake and allow to cook for 2-3 more minutes. Serve with real Vermont maple syrup. Plan your delicious and pancake-filled 2017 getaways at the 12 Distinctive Inns of New England by clicking below on links that will take you directly to each of their websites. 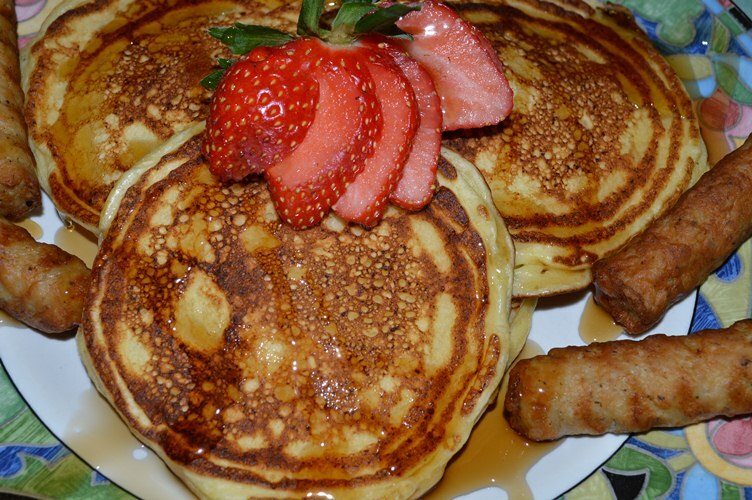 This entry was posted in advice, Cliffside Inn, culinary travel, Distinctive Inns of New England, Inn at Harbor Hill Marina, Rabbit Hill Inn, Recipe and tagged breakfast pancake recipes, breakfast recipes, breakfast recipes from New England innkeepers, National Pancake Month, National Pancake week, New England breakfast recipes, New England pancake recipes, New England recipes, Pancake Month, pancake recipes for National Pancake Month, Pancake recipes for National Pancake Week, Pancake recipes from B&Bs, Pancake recipes from inns, Pancake recipes from New England B&Bs, Pancake recipes from New England inns, Pancake Week, recipes from Cape Cod inns, recipes from Connecticut inns, recipes from Rhode Island inns, Recipes from Vermont inns by DINE Blogger. Bookmark the permalink.